Robert Bosch, the world’s largest auto-parts supplier, was linked to emissions-cheating allegations against a fourth automaker on Thursday, raising questions about the German company’s role in the scandal gripping the car industry. Bosch and General Motors are co-defendants in a lawsuit filed Thursday by owners of diesel-powered pickups who accused the automaker of using illegal software, known as a defeat device, to pass U.S. emissions tests. Bosch “participated not just in the development of the defeat device, but in the scheme to prevent U.S. regulators from uncovering the device’s true functionality,” according to the lawsuit filed in Detroit federal court. The technology was so sophisticated that it could recognize when a car was being tested in a lab or smog station to feign clean emissions and compliance with pollution standards, according to U.S. regulators. It’s the fourth time in less than two years that automakers using Bosch’s diesel engine software have been accused in court by regulators or vehicle owners of cheating on emissions tests. On Tuesday, the U.S. Justice Department accused Fiat Chrysler Automobiles -- which also uses Bosch engine software -- of rigging its cars to pass emissions tests. GM spokesman Pat Morrissey said Thursday’s suit is “baseless” and its vehicles comply with environmental standards. FCA said on Tuesday that it “intends to defend itself” in the Justice Department lawsuit and denied any willful wrongdoing. Another Bosch user, Volkswagen Group, admitted in 2015 to flouting pollution rules and has committed to spending more than $24.5 billion paying fines and penalties, including buybacks, across North America. Car owners also alleged in a 2016 lawsuit that Daimler’s Mercedes-Benz used defeat devices. That lawsuit was thrown out but then amended and re-filed in December, adding Bosch as a defendant. Merecedes has denied any wrongdoing, but earlier this year suspended seeking certification for 2017 diesel vehicles citing the “significant increase in effort” needed to win approval from the U.S. Environmental Protection Agency. In each case, the vehicles used Bosch’s EDC-17 control unit, a computer used to regulate the diesel engine’s operation and control emissions, according to the GM lawsuit. That chip is “a good enabler for manufacturers to employ defeat devices as it enables the software to detect conditions when emissions controls can be detected,” according to the lawsuit. “Although this case is not about Volkswagen, Bosch’s history with VW provides background and support for its participation” in the racketeering “of which Bosch and GM were participants,” the GM truck owners claimed. In the VW case, vehicle owners accused Bosch of being “an active participant in a massive, decade-long conspiracy with VW,” according to court filings. 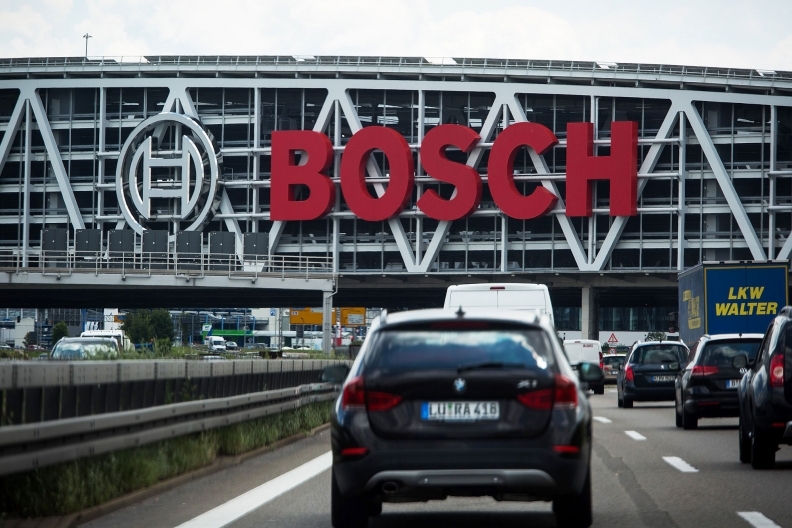 Bosch didn’t admit wrongdoing but agreed to pay $327.5 million to end the class-action in February. Bosch faces an investigation by the U.S. Justice Department into possible criminal charges, people familiar with the matter said in September. German prosecutors are looking into whether Bosch employees helped VW rig software. Stuttgart prosecutors said Friday that they’re also investigating Bosch in relation to a probe of Daimler, which was the subject of police raids across Germany earlier this week, and a spokesman at the supplier said the company is cooperating. In the FCA lawsuit, now pending in U.S. District Court in San Francisco, Bosch and the carmaker are alleged to have installed software to manipulate the emissions control systems when the car was in testing. “Rather than finding a way to improve performance while maintaining the emissions control system,” the companies conspired to hide the actual level of pollutants, according to one of the 20 pending complaints against Fiat Chrysler, many of which also name Bosch as a defendant. FCA has proposed a software update to the EPA which attorneys say is capable of resolving the dispute “in a matter of weeks.” It would minimize or eliminate any need for payment of monetary damages to plaintiffs, the company said. Bosch has yet to issue a written reply to the claims, but supported the carmaker’s efforts to produce a fix. Tom Schoenberg, Gabrielle Coppola, David Welch, Dalia Fahmy and Christoph Rauwald contributed to this report.